Little Blue Tower ~ Welcome, fellow Traveler. Wander into the art of *Jennifer De La Torre*: First WIP of the New Year! Running just a tad behind on schedule for the Square Show 4 at the Bear and Bird Boutique + Gallery, but here is a sneak peek of the piece I will be presenting. The illustration will feature Prince Regolith and my girl, Anila. It will be a very serene and whimsical lake/forest setting. It will also give me a chance to formally present Regolith and his otherworldly features. 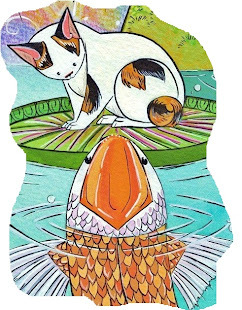 I'll also be adding some Koi fish inspired by an old illustration from my Maneki Paw Collection: Conversation. I really can't wait to finish this. Stay tuned for more wips, and keep an eye out for the show. The opening will be January 17th!